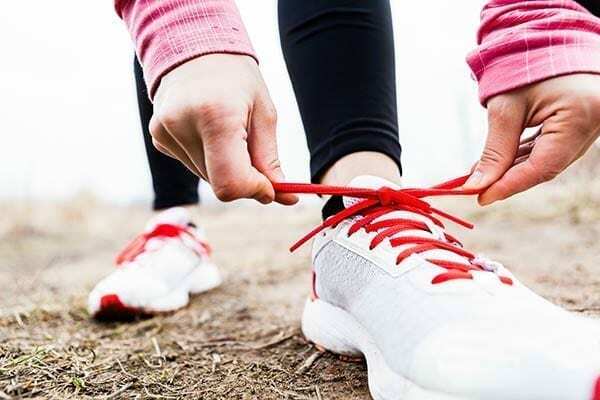 Running errands in your favorite old pair of sneakers might not pose a problem, but when you start walking for exercise, even after just a short time on the pavement, those same shoes may rub your heels or throw off your gait. Newer is better. Your walking shoes don’t need to have as much cushion as running shoes, but they should retain their structure for up to 600 miles. Find shoes made for walking. Because a walker’s heel strikes down before the toe, your walking shoes need to use stiffer rubber to support the heel. Wear shoes that fit. Even if the design of your shoes is top notch, they won’t do their job properly if they’re not right for your feet. Even if you’re starting with 10- or 20-minute walks on level ground, clothes you wear can cause discomfort. Protect yourself from the elements. Wear polypropylene fabrics next to your skin, rather than cotton. Lightweight synthetic fabrics wick sweat away, helping to keep you cool in summer and keep you warm in winter. Dress in layers. Instead of wearing bulky items, layer thin items on top of each other so that you can adjust easily for temperature. In cold weather, a snug base layer will help trap and retain your body heat. Chafing and blisters can come on fast. For some people, it’s a challenge from the start, and for others they occur on longer walks, sneaking up on you anytime, without any notice. Take care before rubbing goes from minor irritation to chafing, or hot spots on the underside of your feet result in blisters. Don’t get rubbed the wrong way. If your thighs are prone to chafing, consider wearing bike shorts underneath a pair of looser shorts or pants. Glide before you go. Use reliable skin protectants as a barrier to chafing, like Body Glide Original and Body Glide For Her, and Foot Glide Blister Resister for feet. Apply them before you go out the door. They glide on easily to create an invisible, oil-free, non-greasy barrier, and they wash off with mild soap. Drink often. You may not feel thirsty, but you still need to be hydrated. And you need to drink liquids in cold weather, too, especially if you’re working up a sweat or walking at high altitude. Bottles are great on the move. For a short, moderately paced walk, you can carry a water bottle with you. Just be sure to drink enough before you start, and after you return. Keep your energy up. Even if you don’t feel hungry while you walk, eating small amounts will help keep your energy levels consistent. Ditch the bar. Sports bars and gels are usually packed with more sugar and calories than you need for a moderate workout. Instead, bring things that are nutritious such as fruit, nuts, and maybe a sandwich to sustain your energy. Setting good habits in place now will help as you begin to increase your distance and they’ll help sustain you down the road.